It’s spring time here in Valencia and once again the children at Mary’s School House had a blast at the Gregory Family Child Care annual Easter egg hunt. Not only did the children fill their baskets with brightly colored eggs, they also enjoyed a surprise visit from the Easter Bunny! We’ve had many hunts in the past but this years group of kids really stood out by showing lots of hustle and making smart decisions. It’s amazing how much the children can learn from just from one egg hunt. When you considering all the preparation that goes into the hunt, the children really had multiple opportunities to learn much more than how to collect the most eggs. First, we started out a week in advance by coloring the eggs. This year, instead of using real eggs we picked up some remarkable plastic eggs, that look and feel just like a real egg. Anyway, we spent a day all coloring the eggs. Of course, this helped the little ones to learn their colors, while the older children learned about mixing colors. Once the egg coloring was complete we used the brightly colored eggs to teach how to recognize and spell the basic colors such as blue, red, white, purple, etc. Now, you might be wondering exactly how many eggs we had ready for the hunt? Well, that’s the next part of the project. On the day of the hunt the children were thrilled to see the Easter Bunny arrive and hide their eggs. Not long after, the hunt was on! Off they went, buckets in hand and did not stop until each child filled their own bucket to the brim! So, I’m sure you can guess this presented the perfect opportunity to work on our counting. This worked out even better for the older children since they were especially motivated to learn to see who had the most eggs. Once the egg hunt was over the children got photos with the Easter Bunny. Unfortunately, one or two of the younger ones were too scared of that bunny, but we were able to get the photos anyway. Our Easter Egg hunt was a perfect example of how we continue using fun activities as a method to help the children learn, often without even knowing it! There’s no need to prod or push the children to learn because they are having so much fun with a given activity, they learn as they go. Not only that, they are much more likely to retain their new knowledge and build on it in the future. 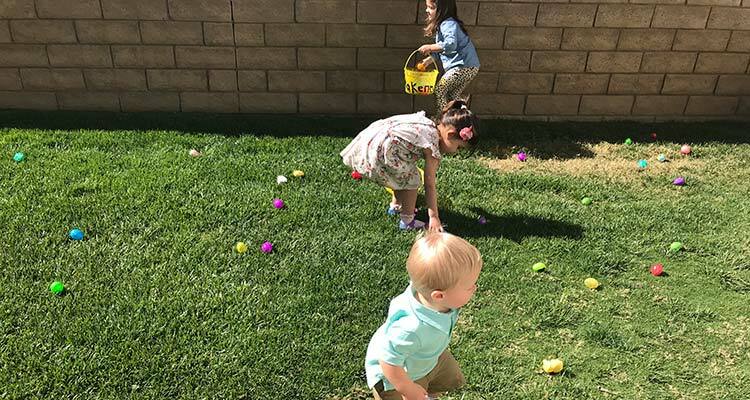 We hope you enjoyed hearing of our annual egg hunt and if seeking home child care in Santa Clarita, be sure to contact us for more information.